I learned about Blue Lagoon a couple of years ago when I received their famous Silica Mud Mask. Blue Lagoon is a must visit spot in Iceland. However, because not everything is so picture perfect here are things worth knowing before you go! Silica Mud, found in Blue Lagoon, helps with various skin conditions, so if you look around near the SPA, you’ll also find a clinic. Make sure to visit this place if you suffer from skin conditions this might be both lovely and beneficial experience. I was super hyped up after seeing some images on the internet, so when we decided to have a cheeky break and go to hide in Iceland, I knew Blue Lagoon was one of the places we would visit. I was hoping I’d get a chance to take a lot of pictures to give you an actual overview on how it looks, but we couldn’t get a slot during a day session. By the time we hit the lagoon it was dark, so you’d have to bear with me and take my word for it. It’s beautiful, but I felt like it was smaller than what I was expecting by viewing images on the web. Book your Blue Lagoon experience in advance. In the past, you could just turn up, and there were always some spaces available to get in. Now it is all booked up, so secure your space online or via Reykjavik Excursions. 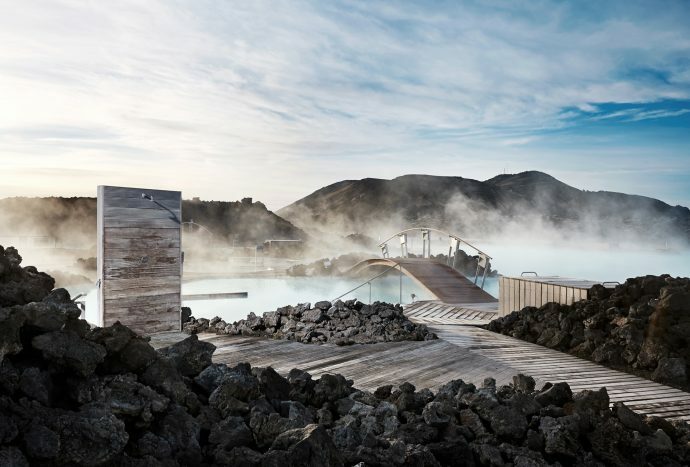 The later offers bus transport to and from Blue Lagoon to Reykjavik. 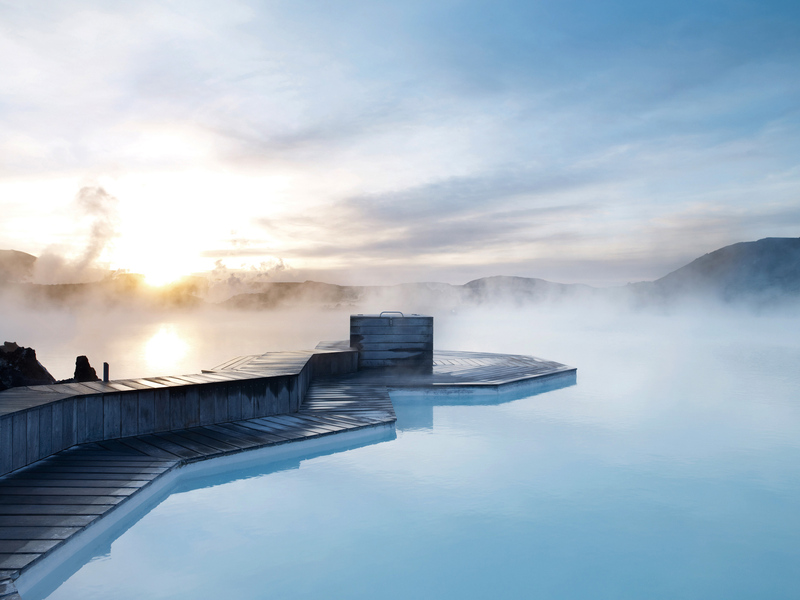 We booked a slot with Blue Lagoon and one-way ticket with Reykjavik Excursions to the lagoon. Afterwards, we took a taxi as we were going to the airport. A taxi would be around £60, but if you’ve booked yourself for an evening session and are not returning to the same destination you don’t have much choice. Don’t stress yourself about the deals available online. Once you start checking what’s on offer, you feel like you need it all. If you’re anything like me, you’ll be panicking thinking you’re going to freeze there. Feeling like a package with a bathrobe is a must. I haven’t seen a single person in a robe but loads of them on the hangers. You’ll soon realise that warm water makes you feel comfortable enough to come out into cold air for a little while without freezing. Go for the cheapest package as you can always upgrade before entrance if you change your mind. For example, I didn’t have a towel, and I knew I’d have a drink or two once in the lagoon, so in my case, it worked up better to upgrade from the basic €55 to €70 package. The €70 booking fee provides you with the entrance, silica mud mask, towel, algae mask, and one drink of my choice in the lagoon bar. The €55 package offers an entry and silica mud mask. We had a table booked for dinner at the restaurant overlooking the lagoon. Having dinner there certainly adds charm to the experience and food was delicious too. 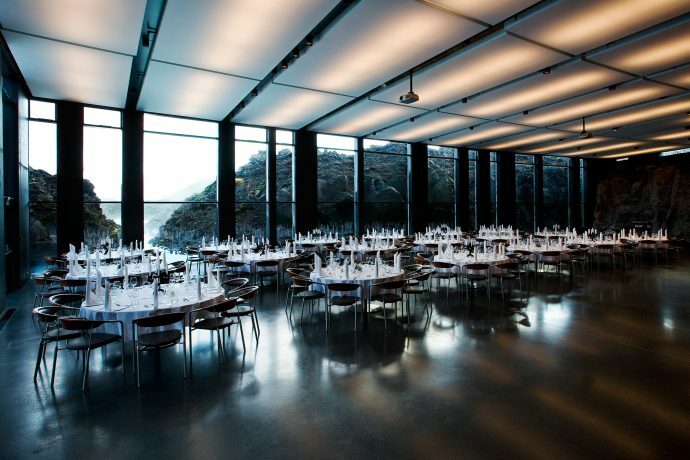 If your purse allows you, I’d recommend you to have a meal at the Blue Lagoon restaurant. Iceland is expensive so if you’re planning on having lush dinner there be prepared it’s not going to be cheap and that’s before you add any alcoholic drink. You’re looking at £40 per person for the main course. We decided to go for their spatial; I think it was roughly £70 each for a four-course meal. That’s without adding wine to it. Next, it was time to dip into the warm waters full of silica to get beautiful. The building is spotless and looks trendy. Despite stylish, modern design the volume of people and experience at the gates made me feel like I was in a factory, on a production line. The entry process has slightly killed my excitement. You see, we had to queue in line just like at the airport security check. A member of staff handed out a wristband to each of us at the gate, which you’d use in the locker rooms and to pay once you’re in the lagoon. A staff member was standing on a stool and talking in a loud voice to the entire group of queuing people how to use it. And what rules obey in the lagoon. All of the information was absolute useful and necessary but in my opinion delivery of it make it feel very impersonal and certainly not luxurious. I love that Icelandic people make you wash properly. I mean no cheating and just getting wet under the shower before entering the pool. In all public swimming pools, you’re expected to have a shower and good clean without your bathing suit. Somewhat self-explanatory but I’ve only experienced this level of cleanliness in a few countries. Pay off – clean pools with hardly any chlorine in it. Protect your hair with an enormous amount of conditioner. Blue Langon provides all showers with their conditioner and shampoo. The silica and salt in the water can dry your hair and make it frizzy, especially if you’re there for a couple of hours. Putting a generous amount of hair conditioner before entering the lagoon helps to protect your hair, so it’s beautiful and manageable afterwards. Once you’re in the lagoon, it feels more relax. I think night session is lovely because you feel more alone compared to the day as you simply can’t see far in the darkness. I couldn’t make my mind if it was busy or not. The only downside is the photography. Taking amazing pictures in such low light is tough. Go Pro cameras work probably best. Oh, and there are waterproof phone cases to hire on hand. Apart from the lagoon itself, there are steam rooms and sauna on the site too. You can get your Silica Mud Mask from a Mask Bar, which is situated it the lagoon. The basic package comes only with a Silica Mud Mask. However, you can get Algae Mask for €3; use your wristband to pay for it. To grab a drink make your way to the other site of the lagoon. The bar is situated roughly opposite to the Mask Bar. That’s where you can grab a glass of prosecco :) Remember to drink a lot of water though as you dehydrate a lot in the warm water without even realising it. Dehydration can be dangerous for your health, so everyone is restricted to purchase only three alcoholic beverages. Your wristband is being used to track how many drinks during your stay to keep you safe. The cold and why you shouldn’t even care! Once again, do not worry about the cold. The water is so warm you’ll feel perfectly fine even when it’s chilly outside. When I was there, the air temperature was around 7 degrees, and I didn’t need to use a bathrobe at all. Even in the winter, you could get away without it. There’s a cheeky passage that takes you from the lagoon directly into the building without having to come out of the water! Win! The Beauty Products you should take home. Of course, there’s a shop on site where you can buy beauty products by Blue Lagoon including Silica Mud Mask. I found this year that is has been reduced in size sine the time I had it last. Now it’s a 100ml tube, but apparently, it has more silica in it. Priced roughly around £55. I picked my products at the Blue Lagoon shop at the airport, but if you buy them in the Blue Lagoon, you can get your tax return form there. I just thought it’d be less hassle to pick it up at the airport as I had no check-in bag, which restricted me to what I was allowed take via the security. Should you visit the Blue Lagoon! Yeah! Absolute a must visit if you’re going to Iceland. It’s their biggest tourist attraction of this kind. It was a fab experience but comparing to local pools dotted in various towns on the Island I do feel it’s a little overpriced. We visited some small local polls and had a fantastic time there too, just without all the silica and nice glass of prosecco. With growing tourism, Blue Lagoon is expanding, and most likely in 2017, there will be a new hotel opened. Ultimately I think if you’re going to Iceland this is a must visit spot. Best time to visit is right after your flight, particularly if you’re jet lagged or just before it. We did it the night before our flight, and it was just the delightful end to our relaxing trip. *Images are courtesy of Blue Lagon. It was a private trip and not sponsored in any way. I only thought all that information might be useful if you plan your visit to Iceland.